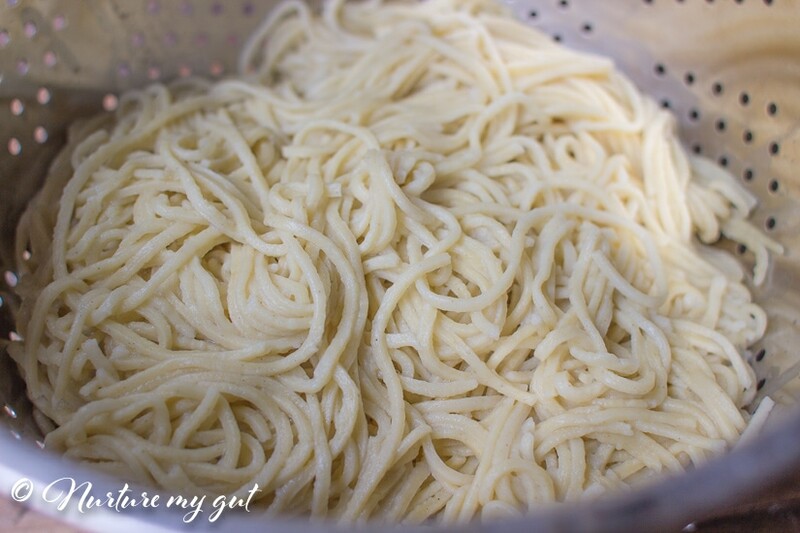 Homemade Gluten Free Pasta made with only 3 ingredients! 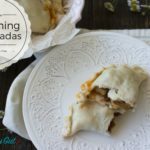 A super fast and easy recipe that tastes better than the real thing! 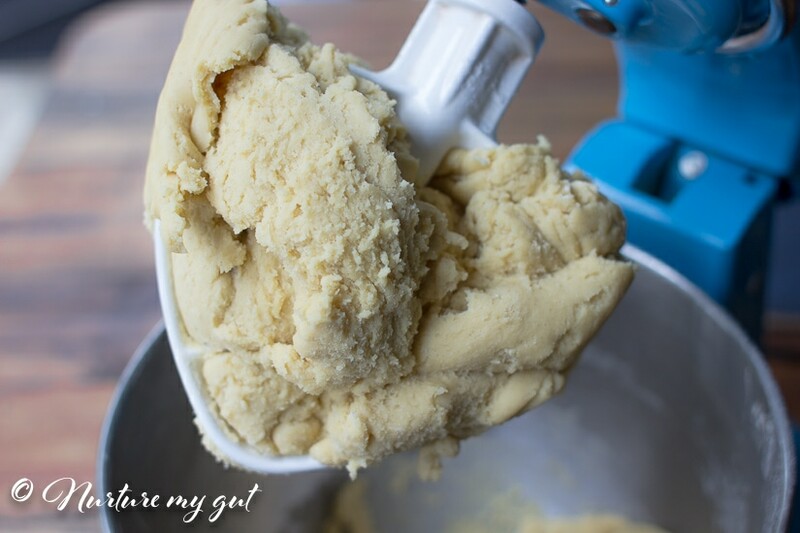 Turn this versatile dough into your favorite lasagna, spaghetti, fettuccine or ravioli recipe…the possibilities are endless! This easy tutorial below will walk you through how to have pasta on your dinner table in less than 35 minutes flat! The first thing you want to do is gather your ingredients. Below I will show you what you will need in order to make this pasta. You can do everything old school by hand, or use a stand mixer with pasta attachment which is what I now use to save time. It is personal preference, either way, this pasta will come out wonderful! Step one is pretty simple, just whisk together gluten-free flour and salt. Then, slowly add your eggs and mix until your dough is no longer sticky. 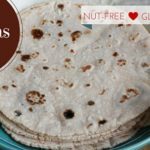 This flour is very different from my Paleo Pasta Recipe that I typically make. This dough requires much more eggs to flour and it is very forgiving. That means that if your dough is too sticky, just add a Tablespoon of flour at a time. On the other hand, if your dough is too dry, just add a Tablespoon of water. You want your dough to gently smash between your fingers like play dough, and be sure it does not stick. I used Bob’s Red Mill 1 to 1 gluten free flour in this homemade gluten-free pasta. It has a light neutral flavor and works really well in this recipe. As you can see in the photo below, the pasta has a lovely yellow hue thanks to my pastured eggs. Once your dough is ready, scrape all your dough out with a spatula and place onto a parchment lined cutting board. Dust with a bit of tapioca flour. 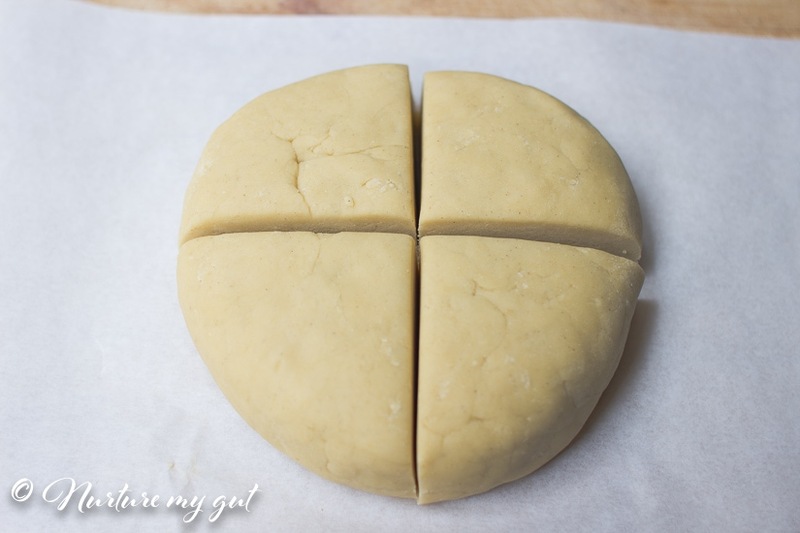 Cut your dough into four equal pieces. 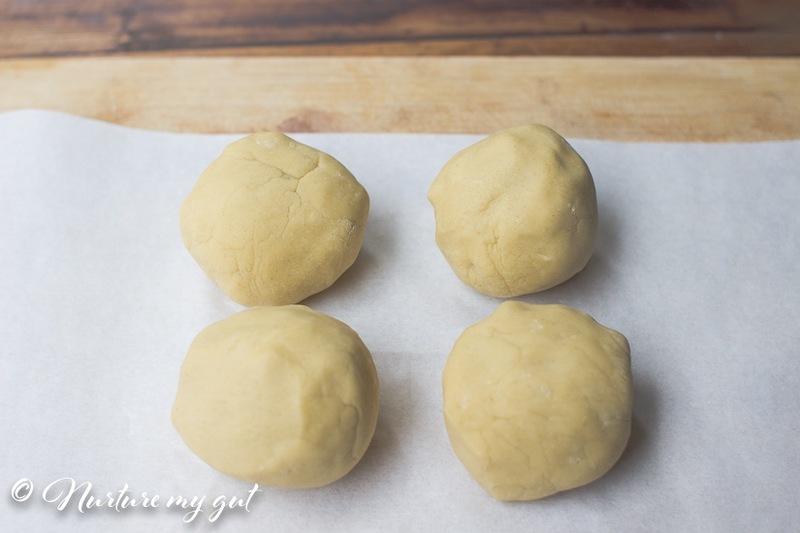 Roll your dough into 4 equal balls. Place dough back into mixing bowl and cover bowl with a towel so that your dough does not dry out. Roll one of your balls of dough into a long disk. Be sure to dust with tapioca flour. You can cut it in half and run it through the machine that way or just run the whole disk of pasta through the pasta machine. I preferred the long disk because it created these beautiful long spaghetti noodles. If you want to cut it by hand, I have a great tutorial and video under my “Paleo Friendly/Gluten Free Pasta” Tutorial. That shows a step by step guide for cutting pasta by hand. To summarize, you cut straight edges all around the pasta, then use a pizza cutter to make fettuccine strips. 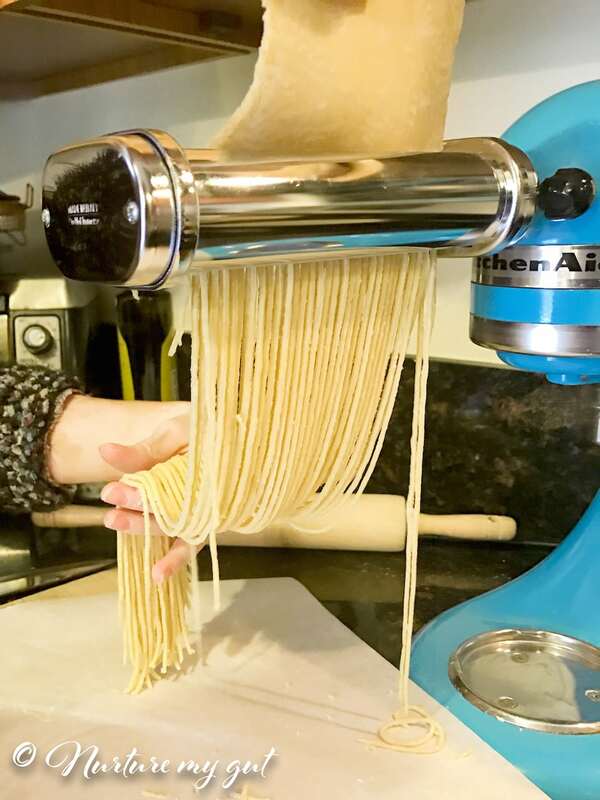 Next, I ran my pasta through the spaghetti pasta attachment for my kitchen aid. I rolled it out about 1/4” thick. 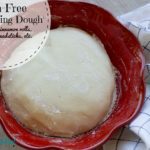 I have made fettuccine with this dough and it comes out great too! You can use this dough to make an endless amount of pasta recipes! Below is what this amazing Homemade Gluten Free Pasta looks like once it has been run through the spaghetti pasta attachment. Isn’t it fabulous! It is so hard to find freshly made pasta, and I live in L.A.! Having it fresh at home is really a special treat! 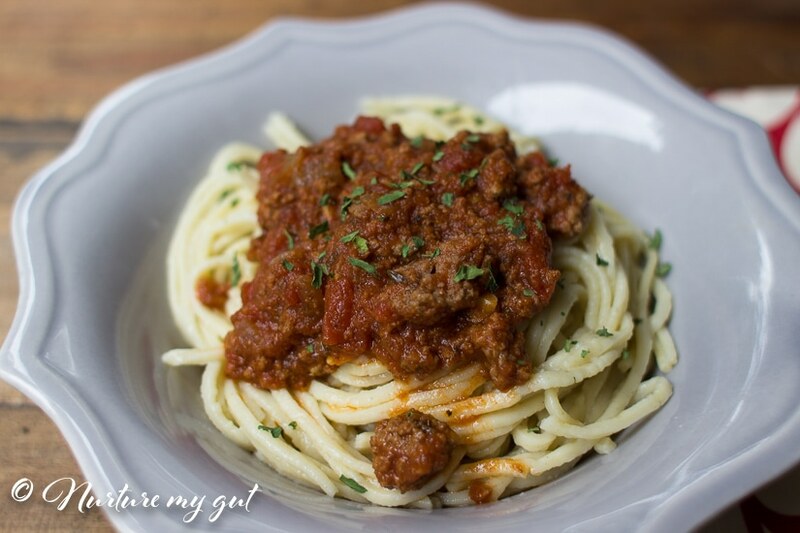 Plus, my kiddos are a huge fan of pasta and they love this recipe! Next, you add your pasta directly into the boiling water, no need to dry the pasta. Once it goes into the boiling water, let it boil 30 seconds and then stir with a pasta claw to separate the noodles. I like to set a timer for 3 minutes and taste it to make sure it is the texture I want. The following step is to scoop the pasta out with a pasta claw and drain in a colander. This recipe does make a lot of pasta so feel free to cut the recipe in half if you don’t want that much pasta. It serves approximately 6-8 large bowls of spaghetti. We really enjoy having left overs and homemade gluten-free pasta reheats really well in the toaster oven. It holds its shape unlike the store-bought gluten-free pasta that falls apart if you reheat it. I send my kiddos to school with homemade gluten-free spaghetti in a hot thermos, I use this one. It is a nice meal for lunch on a chilly day. 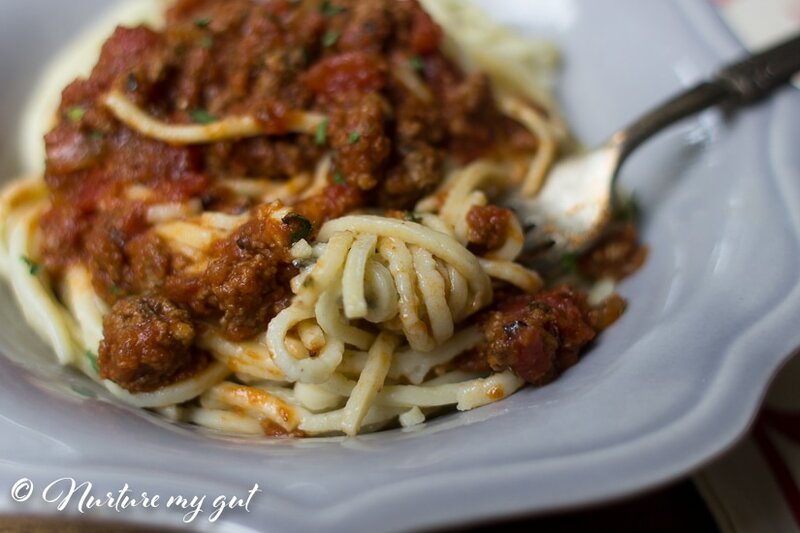 I slightly modified my homemade meat sauce recipe and served it over this homemade gluten-free pasta. 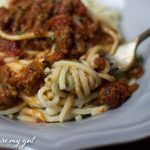 I made my meat sauce in the Instant Pot. It was so easy! I will never go back to making stove top pasta. 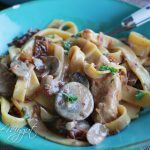 The flavor is so much richer in the Instant Pot. 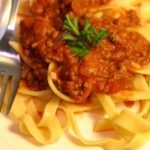 Because it is so easy to cook in the Instant Pot, I made a double batch of all grass-fed beef meat sauce. I will have that recipe up on the blog soon and share here so be sure to stay posted by subscribing below! 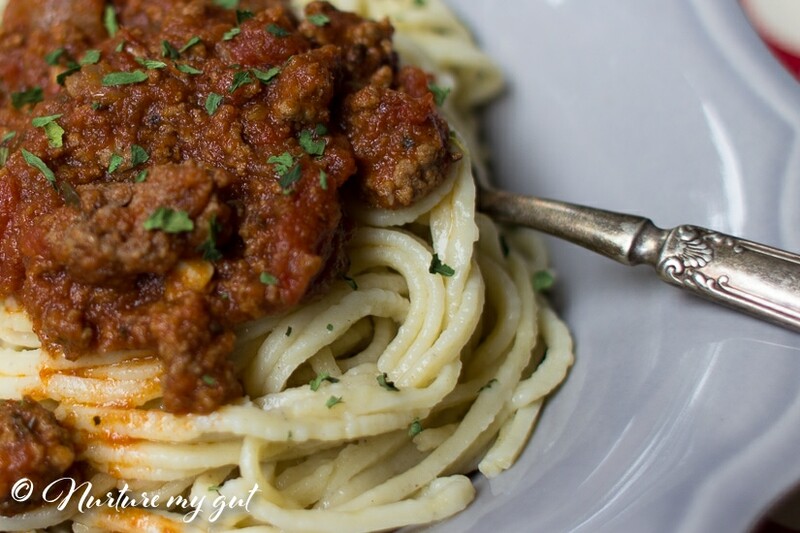 If you have never made a homemade meat sauce before, then you are in for a treat! 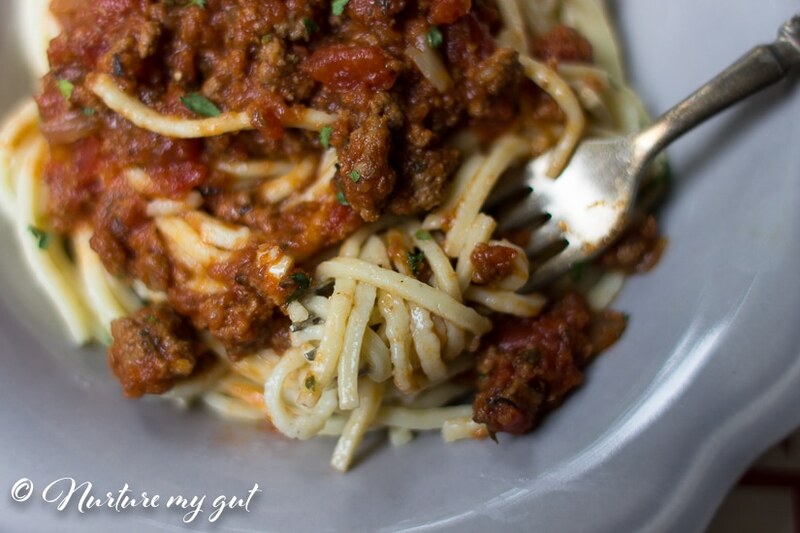 Truth be told, I used to always serve spaghetti from a can until I tasted my husbands homemade marinara back in 2003! I was blown away by the delicious and rich flavors! I modified his recipe to make my own version (with meat of course?) and my family and guests love it! 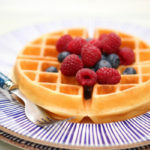 This is one of my favorite meals to serve to guests! It is a hit with kids and adults! Plus, this pasta is so yummy that even people who aren’t gluten-free won’t know the difference! 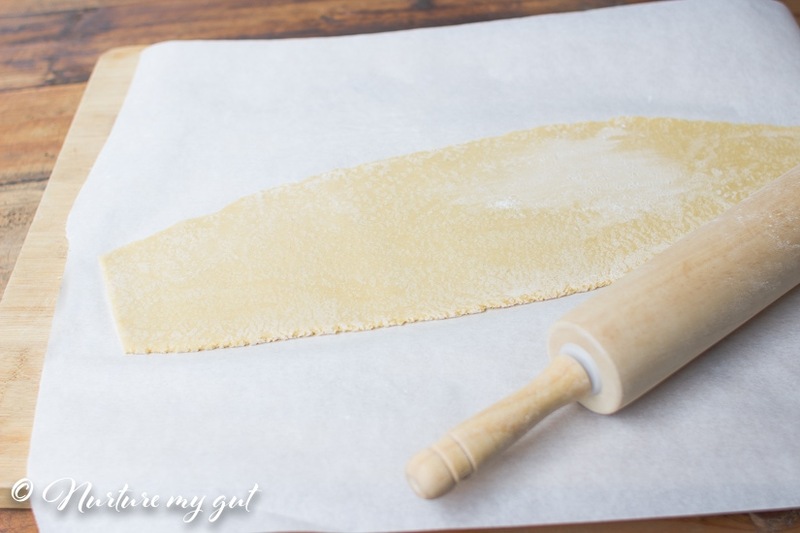 I hope you enjoy this homemade gluten-free pasta as much as we do! 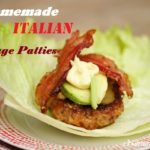 It is fun to make and is a pretty fast recipe! 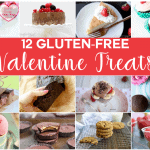 It is gluten-free, dairy free and nut free. 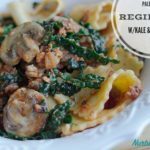 If you are looking for more pasta recipes, check out my Paleo/Gluten free Pasta, Paleo Reginette Pasta w/Kale & Mushrooms and Paleo Pasta w/Dairy Free Cream Sauce. 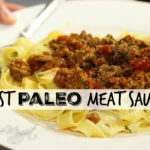 Looking for recipes to serve with this pasta, try my Best Paleo Meat Sauce or 5 Minute Dreamy Vegan Alfredo Sauce. 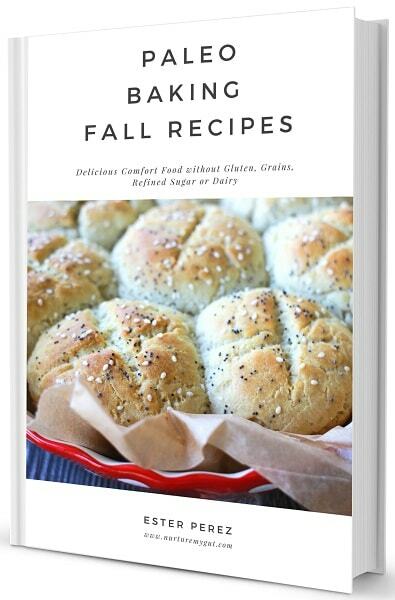 For more delicious gluten-free recipes, be sure to subscribe below! 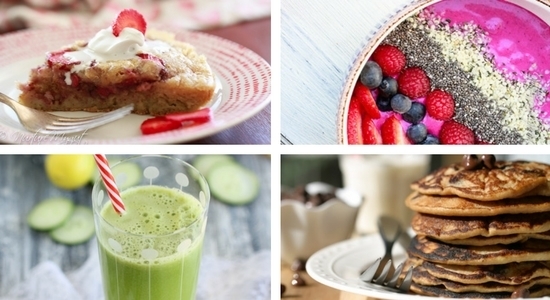 You will get my free Delicious Paleo Breakfast E-book as my gift to you. 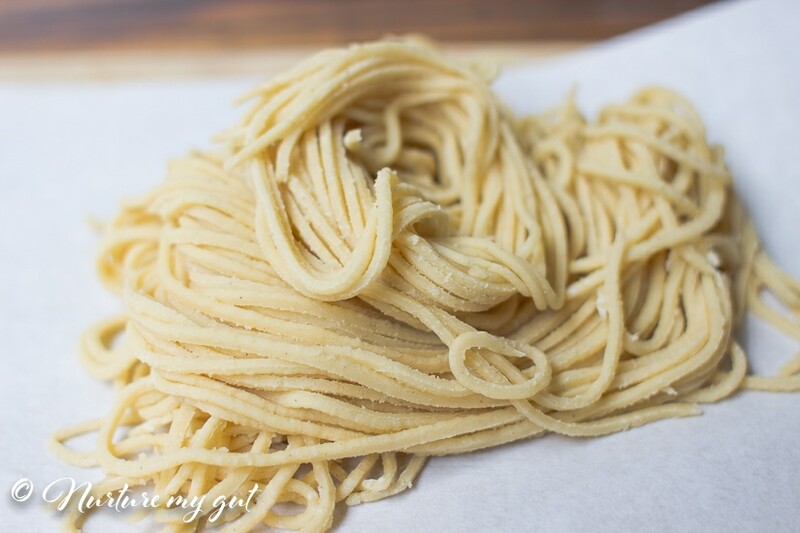 Homemade Gluten Free Pasta made with only 3 ingredients! 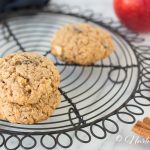 A super fast and easy recipe that tastes better than the real thing! 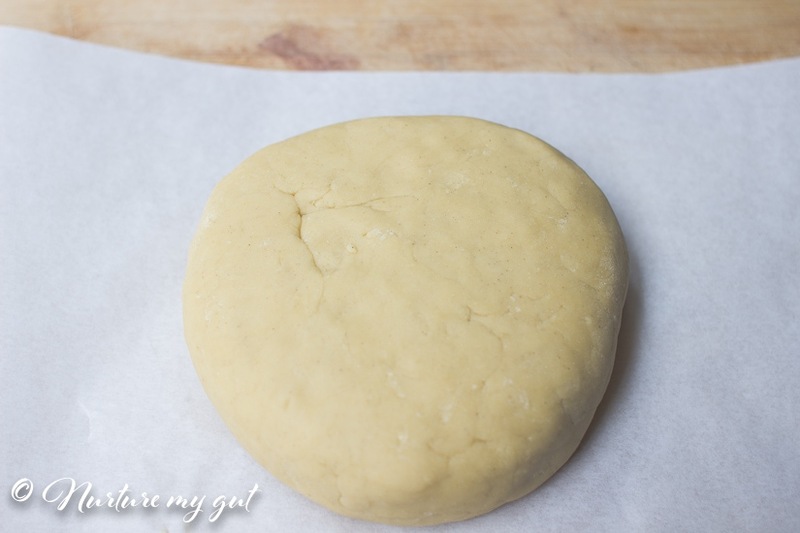 Turn this versatile dough into your favorite lasagna, spaghetti, fettuccine or ravioli recipe…the possibilities are endless! This easy tutorial below will walk you through how to have pasta on your dinner table in less than 35 minutes flat! Place large pot full of water to boil. Whisk together flour with salt. Mix in eggs until pasta does not stick to your fingers. If pasta is too dry, add a tablespoon of water to the dough at a time. 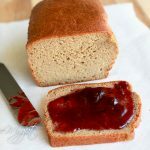 If pasta is too sticky, add a tablespoon of gluten free flour at a time to dough until it is no longer sticky. This dough is very forgiving so you can’t mess this up ? Place a sheet of parchment or wax paper on your cutting board and dust with a bit of tapioca flour. 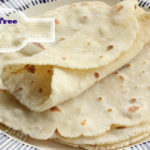 Dust your hands with tapioca flour and roll dough into a large disk. Cut into 4 equal parts. Roll your dough into balls. Place in bowl and cover with towel so they do not dry out. Grab one ball of dough and roll into a long strip, about 16-18 inches long. Slice of the bottom edge so there is a straight line and feed through pasta machine according to manufacturer’s instructions. Repeat with remaining dough. 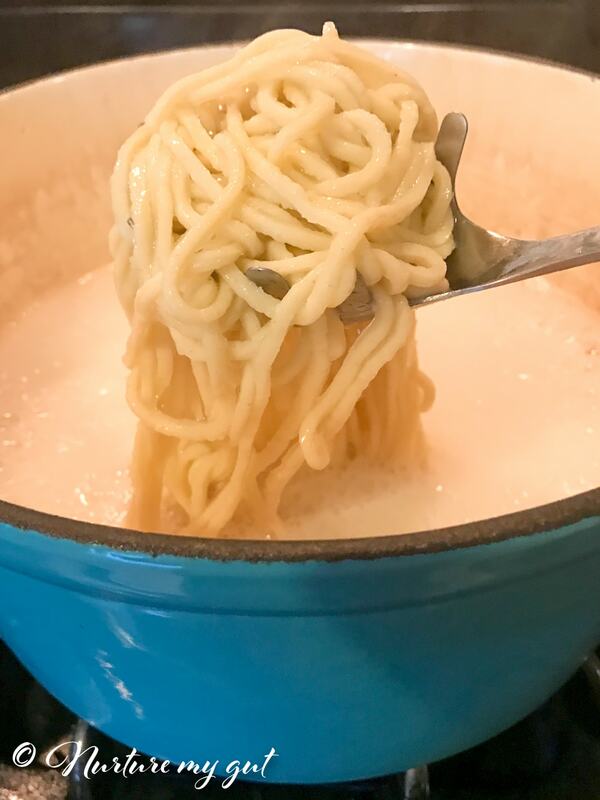 I like to boil each set of noodles as they come out, but you can boil them in 2 batches if you like. Gently add pasta to water and after 30 seconds, separate with a pasta claw. Boil pasta for 3 minutes. Taste a noodle to make sure it is done. Use a pasta claw to scoop out pasta from boiling water and drain in a colander.